After closing its $6 billion transaction with GeoSouthern for 82,000 net Eagle Ford acres at the end of February 2o14, Devon says its current net daily production in the play is 64,000 boe/d. In the second quarter, the company anticipates it will average between 65,000 and 70,000 boe/d, with more than 100,000 boe/d by next year. Devon is banking on high returns from its hefty Eagle Ford investment, and so far, the company appears to be confident it will achieve a lucrative pay off. At the UBS Oil & Gas Conference at the end of May of 2014, the company's COO, David Hager, revealed the Lavaca County acreage is performing better than expected. Currently, the company has 300 total preliminary locations targeted in the county. In DeWitt County, the company has 900 preliminary locations targeted. Recently, another Eagle Ford operator, Penn Virginia, revealed strong results from two of its Upper Eagle Ford test wells in Lavaca County. One of the wells had an initial production (IP) rate of 2,165 boe/d. Company officials for Penn Virginia said in a quarterly update that the two wells have the highest wellhead flowing pressures the company has seen to date in the Eagle Ford, with GORs (gas-oil-ratios) of 5,000 – 6,000 standard cubic feet per barrel. 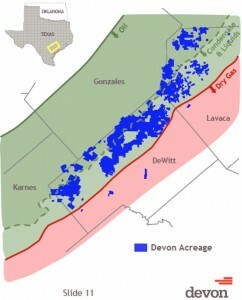 In 2014, Devon will drill approximately 230 wells across its Eagle Ford acreage position. About 200 of those wells are slated to be drilled in DeWitt County under a 50/50 partnership with BHP Billiton. The other 30 wells are to be drilled in Lavaca County, where Devon has a 100% working interest in the majority of the acreage. Also in 2014, look for Devon to drill some Upper Eagle Ford wells.